Figure out what matters to you. Stop. A year ago, I came back from Costa Rica with their mantra of “pura vida!” or the “pure life” in my mind and heart. A few days ago I returned from Italy with much of the same feeling, but in their own words. 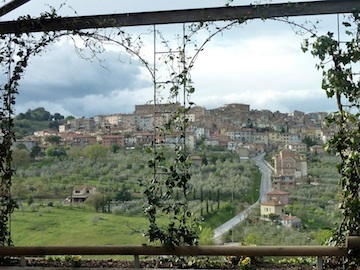 I learned so much about the slow food movement in Italy, and all about making wine and olive oil and other amazing foods, but that is for another blog post. (Some of you may have already seen my photos.) But out of the food and the culture and the scenery came one concept: that life can be fulfilling and content in the simplest means possible, if you just let it be so, and embrace it with open arms. When you make apple juice, Stefano, the owner of the agriturismo we stayed at in Southern Tuscany, says it’s like this: “Apples….stop.” When you make meat, it’s “Pig. Salt. Stop.” His simple directions became a recurring theme for our G Adventures tour group, and one that we laughed at, but all took seriously. We all wanted to work for Stefano and live on a farm by the end of the trip. We all wanted the simple life. It’s so easy for us to get caught up in the complexities of our everyday lives — work, relationships, our hobbies, our commitments. They seem to bog us down more than they fulfill us. Technology seems to burden us and make us feel guilty rather than make our lives easier. We stress over leaving work for a day, or not responding to someone’s email, then wonder why we didn’t sleep well or eat well, or squeeze in a workout or a nap or all the things that we know need and that nourish us. We almost seem to endorse the stress that takes over…wanting more of it, begging for more of it. My dad and I gave each other “that” look across the table when we heard this — earlier that evening we had talked extensively about what we think we want, how to get there, and how to know what exactly will fulfill us and make us happy. It’s the great debate: I’m comfortable, I’m content…but what does that mean? Are we really comfortable enough to leave the standards we’ve set for ourselves and take the big risk? To be fearless? What if that means quitting you career, or moving to another continent? My parents are at the stage where it’s probably easier for them to make big changes and work with it, but what about younger people like myself, who are still waiting to fall in love, and start a family? Still working on my career and figuring out what’s next? What does it mean to be fearless right now versus a few years from now or 20 years from now? I’ve been having a lot of conversations with people lately about how to figure out how to balance the various entities in your life — friends, work, love, etc. There are those folks that think of these things in a linear way: I have to do this, and this, and this, and THEN this can happen. I’ve been on the other end of that, and it’s rough. I’m of the mind that you CAN find a way to fit it all in, but it takes work and compromise and dedication — but what’s the problem with that? If we know that things like families and relationships and having a fulfilling career are all part of the puzzle to make us happy, then let’s just figure it out. It will never be perfect, and it will challenge our minds, hearts, and bodies. But in the end, I think it’s worth it. It gives us the opportunity down the road to then readjust and see how we’re doing. Just because something is hard or scary doesn’t make it worthwhile — in fact, maybe it makes it even more worth the chance. It seems to me that the things that scare us are really the things that we want to do, and feel, and act upon…and we only know what really makes us feel like we’re “living better” when we take the risk, embrace the possibility of failure, and follow our big dreams. When we’re fearless, that’s when we feel alive. Figure out what matters to you. Then go after it. Stop. ← Is Not Being Afraid the Same as Being Fearless? I challenge you to identify your two primary life facets (business, significance, spiritual, family, social, financial, physical, education). Put those two life facets in the spotlight – on a pedestal – and I firmly believe the rest will take care of itself. Drew – you’re absolutely right! When I said “we” I meant it more in the general sense. I’ve always tried to put my relationships at a level in which they are cherished and appreciated, and when they have become toxic, I get out. They’re too important to me to let them take over my life in a negative way. The same with any activities, jobs, etc – if I feel like it’s not making be a better person or helping me to do better in the world, I move on from it. It’s all easier said than done of course, but if we all chose to focus this way, imagine how much happier we would all be! Thanks for your thoughts.